Learn to cut hair with Martyn Holmes on MHDPro. Martyn Holmes started his hairdressing career at a local salon group in Essex in the UK in 1984 and just four years later, bought his first salon in Benfleet, Essex. From there he moved upwards to join a high-profile celebrity salon, exposing him to styling backstage at TV shows including TV AM, Later with Jools Holland and the Jonathan Ross Show. His dedication and skill means he has retained many of his celebrity clientele, including the band Muse. In 2001 Martyn was keen to have his own shop again, and he eventually found the perfect blank canvas among the trendy bars, restaurants and boutique shops of Leigh-on-Sea, Essex. The Strangeways salon quickly becoming a thriving hot bed of hairdressing creativity and fully booked columns, spurring decades of loyalty from its clientele. Martyn’s hairdressing has constantly developed over the years, making him an excellent all-rounder. Between his fully booked salon column, A-list celebrity clients and being a council member with the Fellowship for British Hairdressing, Martyn doesn’t get much time to himself, but when he does, he enjoys Lambrettas and every kind of fishing! 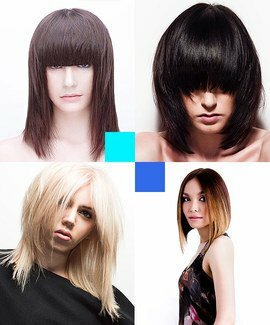 This collection teaches you how to create five long layered bob haircuts that suit a multitude of hair textures and facial features. The techniques can be adapted to provide versatility and dimension to your salon services. This course compliments the Bob It! Collection, to give you a wider range of ever popular bob shapes at your disposal. Featuring a range of haircuts demonstrated by Mazella&Palmer, Bastian Casaretto, Martyn Holmes and Alexander Dinter this online haircutting course is perfect for stylists seeking inspiration and to build their skills and technical expertise. On completion you can download, print and share a CPD Certificate of Recognition endorsed by VTCT and ITEC.